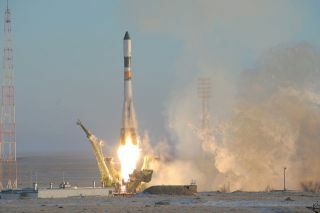 The Progress M-04M cargo ship was launched atop a Russian rocket from the Baikonur launch site Feb. 3. A Russian cargo freighter flying on autopilot performed asuccessful rendezvous and docking with the space station Thursday night,delivering two-and-a-half tons of supplies and equipment for the internationaloutpost and its resident crew. While flying 212 miles over the extreme southwesternAtlantic, the ProgressM-04M spacecraft linked up to the aft docking port of the station's Zvezdaservice module at 11:26 p.m. EST. "Docking confirmed. Contact and capture," NASA commentatorRob Navias announced from Houston's Mission Control Center. "Dockingoccurring almost to the second as had been planned by Russian flightcontrollers." Hooks and latches were engaged a few minutes later to firmlysecure the 24-foot-long craft to the station. The Expedition22 crew of commander Jeff Williams, fellow NASA astronaut T.J. Creamer,Russian cosmonauts Maxim Suraev and Oleg Kotov and Japanese astronaut SoichiNoguchi plan to open hatches and enter the Progress around 3 a.m. EST Friday. The cargo includes 2,683 pounds of equipment, food,clothing, life support system gear, 1,940 pounds of propellant to replenishreservoirs that feed the Russian maneuvering thrusters, 926 pounds of water andsome 106 pounds of oxygen and air for the station's atmosphere. The Progress was launched Tuesday atop a Soyuz rocket fromBaikonur Cosmodrome, reaching a preliminary orbit of 144 by 119 miles. A seriesof precise engine firings over the past few days guided the freighterto the rendezvous. After arriving in range of the space station, the vesselbegan a flyaround maneuver to get lined up with the docking port and thenexecuted a roll maneuver to properly orient its forward docking probe withZvezda. A brief stationkeeping hold with about 530 feet between thefreighter and station allowed Russian flight controllers to assess systemsbefore giving approval to commence the 10-minute final approach. The ship's automated docking system did its job and drovethe craft to the linkup just after an orbital sunset. A headlight on thecraft's nose was turned on, providing suitable conditions for the nighttimedocking. "Progress just docked to ISS! We felt theimpact!!!" Noguchi tweeted live from the space station on his Twitteraccount. It is the 36th Progress to dock with the station over itsdecade-long life and the first of six scheduled this year. The craft joins the previous resupply ship that arrived lastOctober and remains affixed to the outpost, plus two Soyuz crew transportcapsules currently residing at the space station. This is the first time thatfour Russian visiting vehicles have been attached to the complex at one time.